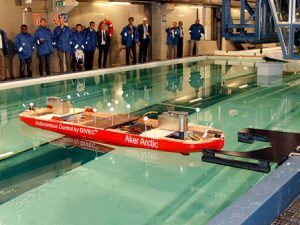 An autonomous ship model has been successfully tested in Aker Arctic’s ice model test laboratory in Helsinki, Finland. In the demonstration test the ship model was able to detect obstacles in the ice tank utilizing onboard sensors, maneuver around them without operator input and moor itself automatically to a target pier. The test was carried out in ice free waters. The wireless model used in the test is equipped with battery powered propulsion units, data transfer to the “shore facility”, and an autonomous navigation system that routes the vessel around obstacles detected by the onboard sensors. The various components are connected using Distributed Intelligent Vessel Components (DIVEC™), a specially developed network framework that provides a modern protocol for connecting devices and transferring necessary data between them. While Aker Arctic’s ice laboratory is normally used to test icebreaking vessels, it is also an excellent facility to develop and test the technology, sensors, algorithms and propulsion control systems being developed for autonomous vessels under harsh environmental conditions. DIVEC™ provides an extensible and adaptable infrastructure that allows interfacing with third party systems and components. The technology used in the autonomous ship model tests in the laboratory is also adaptable to semi and full scale prototypes. With this technology Aker Arctic is ready for the next step in the development of autonomous ships. This article was originally published on Navigator Magazine. Read the original from here.